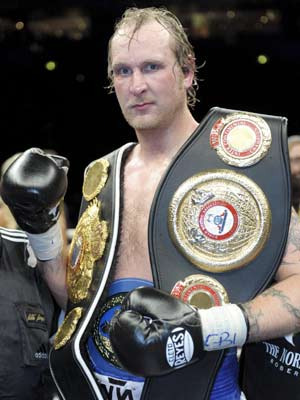 The Nordic Nightmare, Robert Helenius, 19-0, have begun sparring for a planned comeback early 2014. Helenius and his new team have also settled the contractual dispute with Team Sauerland and according to Chris Meyer they are now discussing a co-promotion deal. Helenius is now trained by his father Kalle and will fight out of Finland. Robert have had only two fights since December of 2011 when he won a controversial points win over Dereck Chisora but suffered bad hand and shoulder injuries. Hamburg-based Russian lightheavy Igor Michalkin, 14-1, joins Frenchman Nadjib Mohammedi, 33-3, as co-challenger for the vacant EBU title. The EBU have set December 18 at noon as deadline for purse bids. Mohammedi will defend the WBA Continental title November 30 against Oleksandr Chervyak while Michalkin is tentatively set to defend the WBO I/C crown December 20 so a lot can happen. The Mario Pisanti vs Ivan Ruiz Morote fight for the EU title that was set for November 29 in Latina (Italy) is postponed. No new date have been announced but the EBU insists that fight takes place before the end of 2013. Spaniard Sergio "Schuster" Prado have been appointed co-challenger along with Brit Kid Galahad for the vacant EBU superbantam title. Purse bids will be opened December 18 at noon in Rome. Galahad and Prado fight for the title left vacant by Peter Frampton.